Hrishikesh Mukherjee's career spanned four decades, and he is well-known for being part of the 'middle' cinema - a term that placed his, and his peers' films midway between the full-blown commercial song-and-dance extravaganzas and the 'parallel cinema' movement. His films were always about ordinary people leading ordinary lives, with ordinary problems that had ordinary solutions - though his films did not always have 'happy' endings, they were almost always the only realistic resolution that could be envisaged. He had made his debut as independent director with Musafir in 1957. Though it was not a commercial success, Raj Kapoor was impressed enough to offer Hrishida a chance to direct another film - Anari. In return, Hrishida crafted a simple morality tale, with some very against-the-stereotype characterisations. Rajkumar (Raj Kapoor) is an unemployed artist, who is regularly fired for being too honest. He boards with Mrs D'sa (Lalita Pawar) who is fed up of his inability to pay her rent (he doesn't hold a job long enough to get paid) and as regularly as he gets fired, threatens to evict him. Her bark is worse than her bite though, and she not only feeds him, but also offers him her late son's coat - all the while scolding, scolding, scolding... Her affection for him shines through her every action, and Raj is as fond of her as she is of him. On his way to (another) new job, he runs into a young girl (Nutan). She persuades him to help her by claiming to be a poor working girl, but strangely enough, hails a taxi as soon as his back is turned. Raj, meanwhile, has reached the grandly-named New Taj Mahal Hotel, and is talking to its proprietor, Shah Jehan. Though a bit taken aback at seeing a small cafe, Raj is to be 'manager'; inspecting the food, he spots a dead cockroach in the dal and promptly (and loudly) informs the patrons, much to the restaurant owner's fury. Raj is thrown out of the hotel instead of the dal. Disheartened, he returns to Mrs D'sa's house, planning to leave. The canny landlady, hearing his story makes up an excuse to give him some money. On his way from buying paint supplies, Raj bumps into Aarti again. Upon his enquiring about her 'job', Aarti exchanges roles with her maid/companion Asha on the spur of the moment, pretending she is the companion. She also offers Raj an assignment - paint her memsahib. The next morning, Raj promptly shows up at 'Asha's' mansion in order to paint a portrait of her malkin. The real Asha (Shubha Khote), not able to keep up the charade, escapes by picking a fight with Raj and insisting that he paint 'Asha's' portrait instead. She even gives him the Rs1000 that Aarti/Asha had promised him as remuneration. Already charmed by his simplicity, Aarti is taken aback when, believing her story of an ailing mother, Raj gives her the Rs1000. Having done his good deed for the day, Raj takes leave of 'Asha', promising to come the next day. He makes his jaunty way home, the happiness of having helped someone less fortunate lasting until he reaches home - and Mrs D'sa. On his way to buy dinner, he is knocked down by a rich man; the latter insinuates that Raj had deliberately jumped in front of the car. Raj, however, only wants his athanni back. Amused, the man gets into the car and drives away, unknowingly dropping his wallet. When Raj returns the wallet, the businessman, Ramnath (Motilal) is impressed. He already knows that Raj will not accept charity; this time, he offers him a job. Raj joins Ramnath's firm the next day, and his employer is pleased with his sincerity. Asha, meanwhile, is falling more and more in love with Raj. Much to her frustration, however, Raj does not seem to understand her subtle hints. She is miffed enough to pay him back in his own coin. Soon, however, Raj is bringing Asha to meet Mrs D'sa, an ordeal that Asha is not quite prepared for. Day by day, their attraction deepens, until neither can do without the other. Raj's world will soon fall apart, however, when he realises that 'Asha' is, in reality, Aarti, his employer's cherished niece. The clouds are gathering. A 'flu epidemic has struck the country. Ramnath and his cronies, partners in a pharmaceutical firm, are looking to maximise their profits, wilfully suppressing the news that a box of spurious asthma medication has gone astray and has been mixed up with the 'flu vaccine. Having risen from poverty himself, and having lost his brother and sister-in-law to poverty, Ramnath worships wealth. Learning of his niece's love for his clerk, he coerces her to break up with Rajkumar. When his beloved mother-figure falls ill, is given the contaminated medicine, and dies, Rajkumar is arrested for her murder. It seems like he had both motive and opportunity. Mrs D'sa had made a will leaving him all her possessions. It is Raj who brings her the medicine that causes her death. Will he ever prove his innocence? Will Ramnath and his cronies be punished for their crimes? How far will Ramnath go to win? What about Aarti? 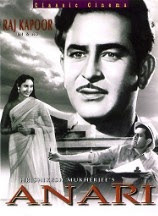 Anari won the National Award for Best Feature Film in Hindi in 1959, and won Raj Kapoor a well-deserved (Filmfare) Best Actor award; Lalita Pawar won Filmfare's Best Supporting Actress award, while Shankar-Jaikishen, Shailendra and Mukesh walked away with their awards for Best Music, Best Lyrics, and Best Playback (Male) respectively. While he was a better director than actor, and while he himself was more interested in crafting a film than in being before the camera, Raj Kapoor's histrionics have been painfully under-rated. It is unfortunate that no one can look past his 'tramp' persona. It is perhaps even more unfortunate that he allowed that to happen. Watch him in the scene where he breaks down because Mrs D'sa believes him a thief, or in Sab kuch seekha humne, where he hides his bitterness at what he sees as Aarti's betrayal. Nutan played Asha / Aarti, the young niece of the affluent Ramnath, and Rajkumar's love interest, who pretends to be poor in order to win his love, only to lose it when the pretence shatters. She is as effective in her light-hearted moments as she is when dealing with the emotional and dramatic scenes. Motilal is good, as expected, as the loving uncle with grey shades to his character. It is his performance in the final reels, sinking into his character, that highlights just how subtle he was as a performer. Lalita Pawar gets another 'good' role as the tart-tongued, kind-hearted Christian landlady, who looks on Raj as a surrogate son. She lifts her performance above the stereotype, the cliché, turning in a sincere, touching and understated performance. This was her film just as much as it was Raj Kapoor's. Anari, while not from the RK banner, had the entire RK team, including music directors Shankar-Jaikishen and lyricists Hasrat Jaipuri and Shailendra. S-J tuned six melodious numbers, each one of them helping to move the plot forward. Hrishida, with a firm hand on the histrionics, toned down the entire pitch of the movie, keeping the narrative low-key, even as the story moved down a path of conflict between crass commercial interests and social responsibility, and the ending was happy - with reservations. Mmmm. :-) One RK film that I like - and for all the reasons you've listed. I thought Lalita Pawar was superb, as were Motilal, Nutan and RK himself. I also agree with that comment of yours about people not being able to see beyond the 'lovable tramp' persona of RK, the actor. In my case, it's the lovable tramp I hate, but RK in roles other than the lovable tramp is far better. In this film, for example; or Teesri Kasam, or Chori Chori. And there's this one scene from Shree 420 in which I find RK absolutely mesmerising. He's in his tux, talking to Nadira, who's wondering if he'll be able to pull off the stunt she's hired him for. He raises his hand, palm oustretched, covering his eyes. And then he sweeps his hand down, and his expression changes as he does so. I always thought RK was a bad actor before I saw that. But now I think if he hadn't allowed himself to get entrenched so deeply in the 'lovable tramp' rut he might've been better respected as an actor, too. My all time favorite RK movie (and my dad's!)! I will comment later since this is the middle of the night and hubby is likely to wake up any time! But this I will say before going away - wonderful review of a wonderful movie which never ceases to bring a smile to my lips, no matter how many times I view it! First of all, THANK YOU. Your review made me go back and watch this movie all over again. Despite the fact that its middle of the night and I will be listening to a long list of "why do you have to" from dear wife tomorrow, I do not regret it. Though, I am not a Raj Kapoor fan( the often discussed and loathed tramp act), Anari is one of those rare movies , where at the end everything fits just smoothly(yes, even Raj Kapoor`s naive act ). It is not obviously, "the best/most accomplished" work of any of the legends involved and yet, it does n`t have any jarring note. However, despite all the goodies Anari provides, for me what takes the cake is Lalita Pawar and her Mrs D'sa. On the paper it is your typical coconut lady(hard outer shell while mussy and soft inside) character, which many others and Lalita Pawar herself has played again and again in varied degree. However, the balance which she brings to this portrayal by underplaying, instead of exaggerating with broad defined strokes, provides a warmth and a endearing quality in each scene. The scene around the end, when Raj Kapoor is leaving the house and touches her feet just to realize she is sick , is one of my most favorite scene. I remember, I was a kid when I watched this scene for the first time with my mum and I instinctively hugged her; today after all these years I felt exactly the same thanks to Ms D`sa. It is Lalita Pawar`s immense acting ability, that after becoming a legend playing such evocative "coconut" roles (Sri 420, Mem Didi) or (Professor, Mr. and Ms 55), she went on to be remembered(by most) as the super wicked mother in law of sas-bahu genre. Wow, you were up late! Thank you for the compliment. It is easy to write a good review when you like the product so much. The question is how to stop gushing! Okay, that is some compliment! Thank you! After RK, it was Hrishikesh Mukherjee who gave Lalita Pawar her 'good' roles. She was brilliant in this film. While she spoke the 'Christian' lingo in the film, she didn't make it a caricature at all. I loved her interactions with RK too. The other scene which I thought was very powerful was where she speaks for him to Jesus, and he breaks down - that scene belonged to Raj Kapoor! This was a very touching movie; it never fails to make me feel a bit teary-eyed every time I watch it. Thanks Anu for this very pleasant reminder of a much appreciated movie, even if not (IMHO) one of RK's greatest! But If there's Nutan, any RK film is worth watching! No I know I'm being partial, there are some where she isn't there, and he steals the scene - Sangam for example: you could review that one next if you are wondering which one to choose! You should have stopped at This is one of my favourite movies. :( I'll forgive you, though, since you had only good things to say about my review. That scene with the rolling pin is hilarious, but of course, Hindi film makers have to use and re-use the same scene for laughs - I remember Asha Parekh in some movie, and Parveen Babi in Kaalia (re)enacting the same scene. If Anuji has to choose a non-RK Raj Kapoor film, may I suggest Hrishida's "Aashiq"? If "Anari" is quintessential film about th etravails of an idealist youth, "Aashiq" is a classic love-triangle genre, rich in its score of music and some very resonationg performances. Another typical Hrishida 'light' punch is when Rajkumar shrieks out "Dal Men Cockraoch Hai", loud enough for a guest enjoying his meal immedautely vomiting out his mouthful, on the very first momnets of his maiden job. This was so poetically summed up by Shailendra in "Sub Kuch Sikha Hamn, Na Sikhi Hoshiyari." If being a tramp was an act Raj Kapoor so successfully put over for his films, he has enough number of films that can give him a far higher than avergae ranking as an actor. And, he could perform well in a comedy or tragic sequences as well. His trademark was a lurking smile hidden over his sorrowful eyes. If he would maintained his trimness- of very early 50s, he could have given his contemporaries, like Dev Ananad or Rajendra Kumar a run for the competition that they would have found difficult by any standards. Ashokji, it is Hrishida and RK, what more can one ask for? :) I'm not a great fan of Nanda, though I did like her when she was dressed very simply - she had a very sweet look - she just couldn't carry the western outfits off. Yes, he does, he does! So much, much more to offer, and with all due respect to Dev Anand, whom I adore, I think Raj Kapoor was a far better actor! Meena Kumari is on record as saying that it was Raj Kapoor who taught her how to modulate her voice, on the sets of Sharda. As for his giving his contemporaries a run, he was never as interested in being in front of the camera as he was, in being behind it. That is probably why. Hi Anuradha. Such a pleasant surprise to read you talking so lovingly about Nutan.Let me tell you I have read the book in Marathi named Asen me Nasen me by Lalita Tamhan ewho happens to be a writer journalist and was with Nutanji for last 6 to 7 years.She looked upon her as her mother friend philosopher guide.I was so touched by what I knew theough the book that have translated it for the benifit of non marathi friends.To let them know what an extraordinary soul she was.so if you want I can send the file to you as well.But only if you promise not to misuse it in any way.I have sent it to Lalita also and have met her too.Dont know when the English book will come out.This I did just spontaneously and have no claims that its a very good one,though Lalita liked it.Let me know and I will send it to you by mail.seema.12.p@gmail.com. Smita, I would be more than grateful if you sent it to me. I had heard about Asen me Nasen me but I do not read Marathi and was waiting for a good English translation to come on the market. Thank you so much for the offer. My only problem with RK in this movie is that he looks too well fed and middle aged to be called a garib naujawan! He should have tried to lose a few pounds. I think the weight was what caused him to look older as well. Plus the fact that he was already 35 by then, so in no way nau jawan. :) He acted well though, so I was able to overlook his physicality. Oops, sorry. :( Seema. Not Smita. I apologise. Welcome to my blog, Mr Apte. Thank you for your kind words. I do not know what you mean by 'make the blog public'. By its very nature, blogs are public. Unless, of course, you went into your settings (on the Design page) and changed the settings to 'Private'. If so, go to Settings and click 'yes' to 'Add your blog to our listings' and 'let search engines find your blog'. If you are still not getting the traffic, I must confess I don't know what else to do. The only other thing I can think of is to tell your family and friends about your blog and let them spread the word. When I first began blogging, I didn't have much traffic or comment either. It's been built up over the last three years. All the best. I have no idea what the Sapno kaa Saudaga group is; have never heard of it before. And you tell me you read my blog there. That is worrisome because no one has asked my permission to put my blog material there.